Keeping the Peppa series alive we have the Cherry Peppa. It features a similar bottom to the Red Peppa, slight single down to a very strong double concave and vee out through the tail. The vee bottom really compliments this board as it has a very flat rocker (which allows it to be uber fast) making the transition from rail to rail nice and simple. 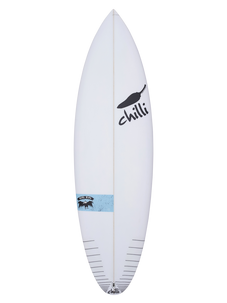 Think, the days you rock up and it's 1 foot summer slop, you won't be driving home without salty hair a a smile on your face if you have this board in the quiver. It's the ultimate summer pal. Equiped with a 5 fin option for your choice of a quad set-up (which we highly recommend on a point break), or a thruster set-up for that shorey bash we all love to go for. Drop 5-6 inches from your shortboard (or 2-3 inches from your Rare Bird), this board has area for paddle power and stability for all levels of surfing.